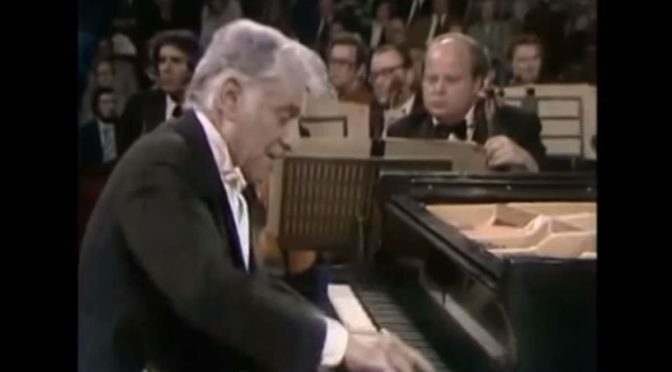 American composer, conductor, author, music lecturer, and pianist Leonard Bernstein performs George Gershwin’s Rhapsody in Blue. Composed in 1924, the work is for solo piano and jazz band, which combines elements of classical music with jazz-influenced effects. Bernstein also conducts the New York Philharmonic. Recorded at the Royal Albert Hall, London in 1976. American bandleader, composer, orchestral director and violinist Paul Whiteman (March 28, 1890 – December 29, 1967) asked Gershwin to write a “jazz concerto”, which became the Rhapsody in Blue; like a concerto, the piece is written for solo piano with orchestra: a rhapsody differs from a concerto in that it features one extended movement instead of separate movements. Rhapsodies often incorporate passages of an improvisatory nature (although written out in a score), and are irregular in form, with heightened contrasts and emotional exuberance; Gershwin’s Rhapsody in Blue is typical in that it certainly has large contrasts in musical texture, style, and color. The music ranges from intensely rhythmic piano solos to slow, broad, and richly orchestrated sections. The opening of Rhapsody in Blue is written as a clarinet trill followed by a legato 17-note rising diatonic scale. During a rehearsal, Whiteman’s virtuoso clarinetist, Ross Gorman, rendered the upper portion of the scale as a captivating (and fully trombone-like) glissando: Gershwin heard it and insisted that it be repeated in the performance. An American Heritage columnist called it the “famous opening clarinet glissando … that has become as familiar as the start of Beethoven’s Fifth”. The effect is produced primarily using the tongue and throat muscles to change the resonance of the oral cavity, thus controlling the continuously rising pitch. Many players also gradually open the left-hand tone-holes on the clarinet during the passage from the last concert F (or earlier if possible, thus employing the right hand as well) to the top concert B-flat as well. This effect has now become standard performance practice for the work. Rhapsody in Blue displays both rhythmic invention and melodic inspiration, and demonstrates Gershwin’s ability to write a piece with large-scale harmonic and melodic structure. The piece is characterized by strong motivic interrelatedness. Much of the motivic material is introduced in the first 14 measures. David Schiff identifies five major themes plus a sixth “tag”. Of these, two appear in the first 14 measures, and the tag shows up in measure 19. Two of the remaining three themes are rhythmically related to the very first theme in measure 2, which is sometimes called the Glissando theme (after the opening glissando in the clarinet solo) or the Ritornello theme. The remaining theme is the Train theme, which is the first to appear (at rehearsal 9) after the opening material. All of the themes rely on the blues scale, which includes lowered sevenths and a mixture of major and minor thirds. Each theme appears both in orchestrated form and as a piano solo. There are considerable differences in the style of presentation of each theme. The harmonic structure of Rhapsody is more difficult to analyse. The piece begins and ends in B flat, but it modulates towards the sub-dominant direction very early on, returning to B flat at the end, rather abruptly. The opening modulates “downward”, as it were, through the keys B flat, E flat, A flat, D flat, G flat, B, E, and finally to A major. Modulation through the circle of fifths in the reverse direction inverts classical tonal relationships, but does not abandon them. The entire middle section resides primarily in C major, with forays into G major (the dominant relation). Modulations occur freely and easily, though not always with harmonic direction. Gershwin frequently uses a recursive harmonic progression of minor thirds to give the illusion of motion when in fact a passage does not change key from beginning to end. Modulation by thirds was a common element of Tin Pan Alley music. The influences of jazz and other contemporary styles are certainly present in Rhapsody in Blue. Ragtime rhythms are abundant, as is the Cuban “clave” rhythm, which doubles as a dance rhythm in the Charleston jazz dance. Gershwin’s own intentions were to correct the belief that jazz had to be played strictly in time so that one could dance to it. The Rhapsody‍’s tempos vary widely, and there is an almost extreme use of rubato in many places throughout. The clearest influence of jazz is the use of blue notes, and the exploration of their half-step relationship plays a key role in the Rhapsody. The use of so-called “vernacular” instruments, such as accordion, banjo, and saxophones in the orchestra, contribute to its jazz or popular style, and the latter two of these instruments have remained part of Grofé’s “standard” orchestra scoring. Gershwin incorporated several different piano styles into the work. He utilized the techniques of stride piano, novelty piano, comic piano, and the song-plugger piano style. Stride piano’s rhythmic and improvisational style is evident in the “agitato e misterioso” section, which begins four bars after rehearsal 33, as well as in other sections, many of which include the orchestra. Novelty piano can be heard at rehearsal 9 with the revelation of the Train theme. The hesitations and light-hearted style of comic piano, a vaudeville approach to piano made well known by Chico Marx and Jimmy Durante, are evident at rehearsal 22. The piece received its premiere in a concert entitled An Experiment in Modern Music, which was held on 12 February 1924, in Aeolian Hall, New York, by Paul Whiteman and his band with Gershwin playing the piano. While critical reaction was mixed, the audience was thrilled and the work was recognized immediately as something new and excitingly different. Even now, with the vantage of retrospect, the Rhapsody in Blue eludes convenient classification. Is it classical music with pop elements, or jazz with serious pretensions? Some critics described the piece as formless, and claimed that Gershwin only glued his melodic segments together into one piece.